Bridge to Terabithia is a 2007 American fantasy adventure drama film based on the Katherine Paterson novel of the same name, and released by Walt Disney Pictures. 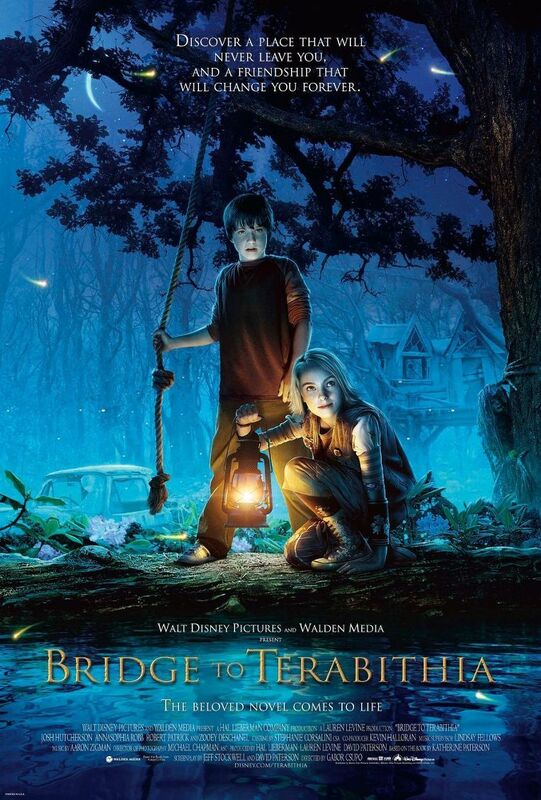 The film tells the story of Jesse Aarons and Leslie Burke, ten-year-old neighbors who create a fantasy world called Terabithia and spend their free time together in an abandoned tree house. The font used for the movie title in the poster is probably Trajan designed in 1989 by Carol Twombly for Adobe. Trajan is an elegant typeface well-suited for display work in books, magazines, posters, and billboards, and it is frequently seen on American movie posters and television shows. In addition to Bridge to Terabithia, Trajan typeface is also used in the following logos, movie posters or album covers etc., including: Flags of Our Fathers, Challenger (Memphis May Fire), I Am Legend, Star Wars Battlefront, The Water Horse, Americano, Minority Report, Lincoln, House of Payne, 13 Treasures, Crispin Cider Logo, Batman Arkham Origins, Quiz Show, Yankee Candle Logo, The Last Samurai.